Why Have Your HVAC Unit Professionally Cleaned & Inspected? Recent statistics indicate that the average Canadian homeowner spends just over $2,200 on cooling and heating costs annually. Of course, if you decided to dive full-on into home renovation, upgrading to all Energy Star-certified appliances, sleuthing out and sealing up every last crack and crevice, weather-stripping windows and doors, piping in additional insulation—the works—you could surely save yourself some of the hard-earned cash you are spending on heating and cooling energy. But not everyone is in a position either timewise or financially to go all out at once. In this post, find out how you can start saving on energy utility bills right now just by having your HVAC unit professionally cleaned and inspected. If you read one and only one part of this post, read this section. Please! Yes, it is great to save money on your monthly energy bills. It is awesome to have cleaner indoor air to breathe. And it is great to know your HVAC unit is working at peak efficiency. But none of this matters if you are not around to enjoy it. Poorly maintained, dirty HVAC units are one of the leading causes of home fires in North America. A full 6,900 out of the 7,200 home fires annually relate directly to HVAC units—air conditioners, furnaces, heaters, or heat pumps. Property losses run into the millions each year for this same reason. Sadly, more than 30 civilians also lose their lives annually due to HVAC-related fires. The gamble with any HVAC system is, of course, that a home fire may or may not happen in any given year. Below, we will examine what absolutely will happen once you have your HVAC unit professionally serviced. Aside from preventing a fire, the first and probably most compelling benefit of having your HVAC unit professionally cleaned and inspected is simply this: you will save money. The HVAC Inspection, Maintenance & Restoration Association (NADCA) estimates that energy savings post-cleaning and inspection can reach 25 to 40 percent. Example: Let's say your household represents the national average energy expenditure of $2,200. Post-HVAC cleaning/inspection, you begin saving 25 percent annually on your energy costs. That is an extra $550 in your pocket annually. OR, let's say you begin saving 40 percent annually! So that is an extra $880 added to your bottom line each year. In this next segment, we see savings in "softer" costs. This is because it is not always possible to tie in cleaner indoor air with energy savings. But where it is possible to make direct cost savings comparisons is in health expenses. HVAC units that are not regularly cleaned and maintained begin to accumulate toxic matter, including dust, dust mites, pollen, dirt, chemical by-products, dander, smog, and other poisons. These poisons are then recycled over and over again in your indoor air supply at home or at work. This is why the EPA estimates that indoor air quality is 2 to 5 times more toxic than regular unfiltered outdoor air. Constantly breathing in this toxic air during the 90 percent or so of the time you are indoors each day can cause anything from chronic coughs and allergies to the onset of asthma to long-term degenerative health issues such as lung and heart disease. Ultimately, the health costs associated with continually breathing in toxic indoor air are potentially astronomical when compared to the simple annual maintenance cost of keeping your HVAC unit clean and well maintained. 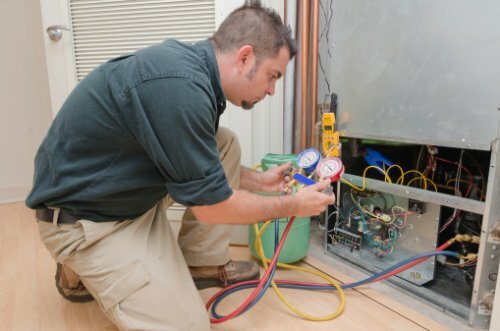 When your HVAC unit is regularly (at least once per year) maintained, inspected, and cleaned, worn or broken parts will be replaced, lubricants will be refreshed, wiring and insulation will be inspected and repaired or replaced as needed, dirt and debris will be cleaned and flushed out, and filters will be changed. Your system will be able to operate at peak efficiency again once the inspection and cleaning are completed. This means you are much less likely to face emergency repair charges in the time period between inspections and cleanings. This can save you anywhere from $75 to $900 per repair call. One of the most wonderful side benefits of having your HVAC unit cleaned and repaired at least once annually is that you will face fewer untimely service outages (and we all know these mostly come at night, on weekends, and on national holidays!). No one has ever claimed to enjoy sweltering or shivering the day or night away while waiting for the repair technician to arrive. By taking a proactive approach and having your HVAC unit maintained, inspected, and cleaned regularly, you can look forward to uninterrupted cooling and heating in the interim months all year long. You should also expect promptness, courtesy, professionalism, and expertise from your HVAC service technician! Here at Shipton's Heating & Cooling, we have nearly a century of expertise in the HVAC industry. Contact us at 905-549-4616 or online for a no-obligation service quote or to schedule your HVAC cleaning and inspection service.